Acupressure is a system of physical and energetic healing that uses pressure on specific points and channels to stimulate or balance the flow of energy through the body. There are 12 primary paired meridians associated with specific organ systems. The Spleen/Stomach meridian supports the immune system and balances hormones and cellular fluids. 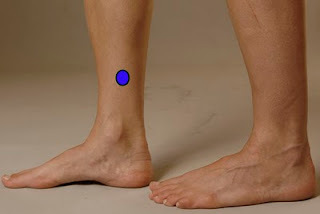 Acupressure points on the Spleen meridian are especially useful for labor induction, edema reduction, uterine concerns, and relief of nausea. During Pregnancy, an imbalance in the Spleen meridian may manifest as Constipation, Heartburn, Hemorrhoids, Mood swings, Diabetes, Nausea, Varicose Veins, Edema, Leg cramps, Yeast infections, Gestational Diabetes. During Labor an imbalance may result in sluggish labor, or difficulty beginning labor. During the Postpartum period an imbalance in the Spleen meridian may affect lactation & uterine concerns. So you can see that this is a powerful meridian to know about during pregnancy and birth! The point Spleen 6 is especially strong for all conditions of the lower abdomen. This point is generally contraindicated for use during pregnancy until the last couple weeks of pregnancy, due to its powerful hormonal influence and ability to stimulate labor. After that point, unless contraindicated by an acupuncturist for some other reason, it should be on your list of tools to use for helping the body prepare for the upcoming birth. To find this point: Put your pinky finger on the top edge of your inner ankle. Lay the rest of your fingers against your inner leg to measure up 4 fingerwidths. Feel just above the top finger and press in carefully behind and against the bone/tibia. This can feel tender so be careful! Feel around in this area until you feel that tender spot. Hold that point for several minutes, sensing into a pulsing of energy beneath your finger. Imagine this point helping to open the body and balance the birth hormones, preparing this mother to ride the current of birth when its ready to begin. Use this point several times a day beginning 2 weeks before your due date. In the next posts I will write about other points to use in conjunction with this one. The use of these points is clearly described in my video: Touch Techniques for Birth. Remember that no point is a magic button that acts independently of the rest of the body, or has immediate effect in triggering labor to begin, so don't worry about finding this point during pregnancy to see how it feels! It can take hours/days/weeks sometimes of working with a point to have the desired influence, and is dependent on the readiness of mother and baby!